1. Start by preheating the oven to 375 degrees. Place the prepared acorn squash cut side down on a parchment lined baking sheet. Place the squash in the oven and bake for 30 min. Take baked squash out of the oven and set aside. Turn the oven down to 350 degrees. 2. Place a large saute pan on the stove top over medium heat , add the ghee and when melted add the mushrooms and begin to saute. Don’t touch the mushrooms for a minute or so to give them time to brown. Next add the onions, celery and garlic and begin to saute with the mushrooms, salt and pepper the veggies just a bit. Saute for 5-7 minutes. 3. Next add the beef, use a potato masher to incorporate the meat into the veggies, season with a little more salt and pepper. When the beef is just about cooked, another 5-10 minutes add the rosemary, sage and thyme. Stir to combine. 4. Pull the beef and veggie mixture off the heat and add 1/2 c. chopped parsley, cooked brown rice and chopped kale, stir well to combine all the ingredients. 5. Scoop the mixture into the acorn halves, in a separate bowl combine 1/4 c. remaining parsley and cheese, season lightly. Spoon this mixture over the stuffed acorn squash (there will most likely be extra filling, save for a snack). Bake in the oven for 20 minutes or until the cheese has melted and began to brown and the mixture is warmed through. Serve hot with a drizzle of good quality olive oil. ENJOY! Shiitake Mushrooms: These meaty flavorful mushrooms contain a substance called eritadenine, which encourages body tissues to utilize cholesterol and lower the amount circulating in the blood. Shiitake also have antiviral and anti-cancer effects. Acorn Squash: Acorn squash is an excellent source of vitamin A, vitamin C and beta-carotene. It is also a very good source of thiamin, vitamin B6, potassium, magnesium,and manganese, and a good source of iron. It is a great seasonal choice in place of traditional bell peppers which are a late summer crop. I made these bad boys for my Holistic Nutrition class last weekend. I wanted to show my students what eating a more plant-based Holistic diet looked like. 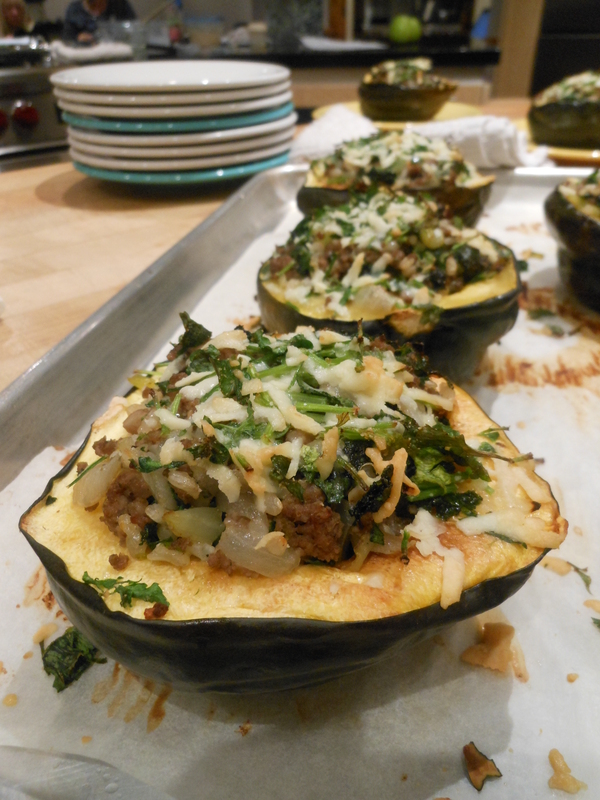 We started with Raw Oatmeal made with Homemade Almond Milk and served it with local Drake Family Farm Goat Yogurt, our lunch item was Lentil Stew w/Kabocha squash and for dinner we had these Stuffed Acorn Squash. When people hear the word plant-based they think vegan or vegetarian, but to me it means whole foods in the natural state that are local and seasonal, not processed packaged foods. I live by a 90-10 rule, 90% of my diet consist of plant foods, this includes beans, legumes, grains, rice, nuts and seeds, and lots of fresh fruits and veggies, the other 10% leaves room for local, sustainable QUALITY animal foods, this includes local beef and chicken on occasion, wild fish, yogurt and cheese. It’s not the quantity but the quality of the choices we make, this is what Holistic Nutrition is all about. I hope you enjoy this recipe, my students sure did! Are you using ground beef or something else in this? Local grass-fed beef, you could most certainly make it without meat and amp up the veggies.